All of our prior shoots have been really casual, so I'm wanting a look that is a little more festive without screaming "we bought these outfits just for our Christmas card photos". Can you help me put together some ideas for the three of us that coordinate without being matchy matchy? One of my favorite silhouettes right now is the long cardigan over a knee length dress with a thin belt. I've been wearing it myself lately and it is SO forgiving. The open cardigan creates a vertical line down the body and the thin belt defines the waist. Add some fun jewelry and flats, and you're good to go! For dad, I picked a casual gray button down since plaids and stripes can get distorted in photos. Paired with dark jeans, it looks nice but not like he's on his way to the office. Finally, for little Jackson, I picked a fun sweater from Baby Gap, khakis (or jeans) and a cute hat to use as a fun prop in the photo shoot. "Oh hi, we were just decking our halls"
This look is pretty casual, but I think it would photograph nicely in an outdoor setting. For Meredith, I followed the same formula of flowy, but not bulky, base layer and a belted cardie on top. I added my favorite Long & Lean jeans because they're super flattering. 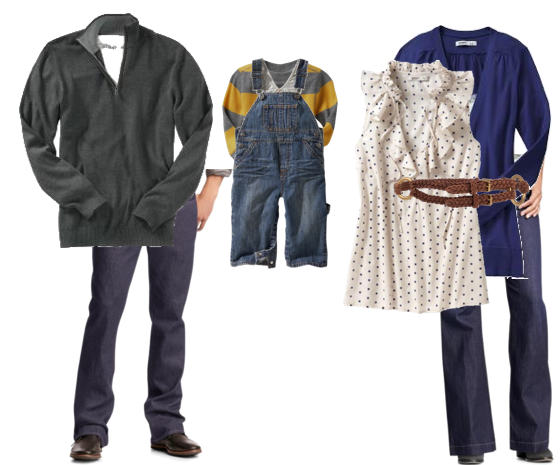 For Justin, I picked an olive colored quarter-zip sweater and dark jeans and then picked overalls and a striped thermal shirt for Jackson. 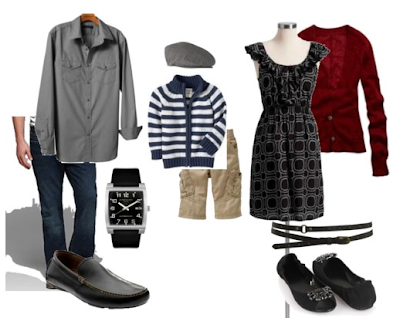 The last option I put together is the most dressy and more appropriate for a holiday party. 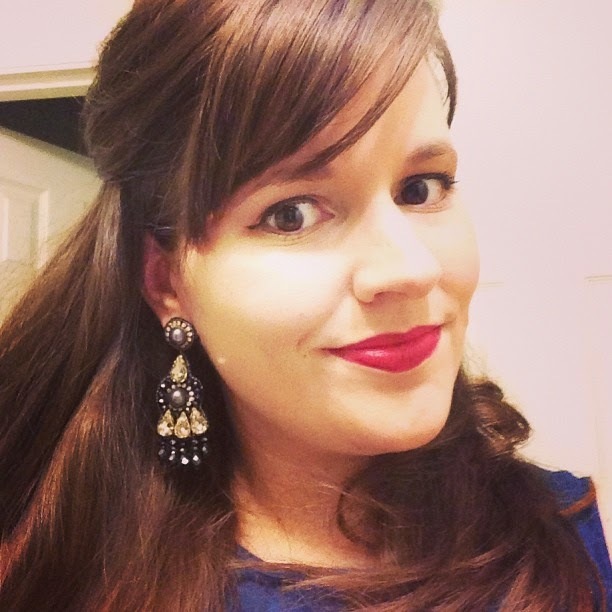 For Meredith, I picked a fun swingy coat in a deep red worn over a chic drapey dress from Gap. For Justin, I selected a jewel tone sweater with basic gray pants. And for Jackson, I picked a button down shirt and the same khakis from before. These are great combos for photos, Haley! I would love it if my clients showed up in ensembles like these. Well done! These are fantastic Haley! Thank you so much! I am totally ordering all of outfit #1 and picking some pieces from the others to incorporate into stuff we already have. Thank you for doing this for me! I will definitely share our pics with you!